Coming from Amsterdam on N44, turn right after crossing the N11 (tunnel) at the trafficlight at the Garden nursery opposite Louwman Museum for Classic cars. Follow the sign “Duindigt”. After about 600 meters you will see the entrance to the clubs parking area on your right. Coming from The Hague on the N44 you can not turn left at the trafficlight (exit Louwman Museum). About 100 mts before the trafficlight take the exit to the right and swing back to cross the N44 towards Duindigt/Garden nursery. 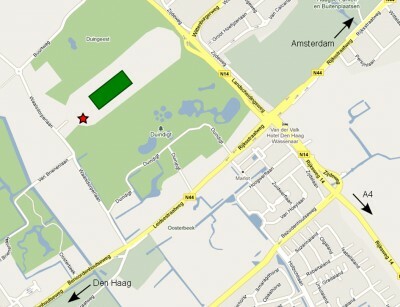 Follow the road for about 600 mts and the entrance to the parking of Polo Club Wassenaar is on your right. (Red star 0n the map). 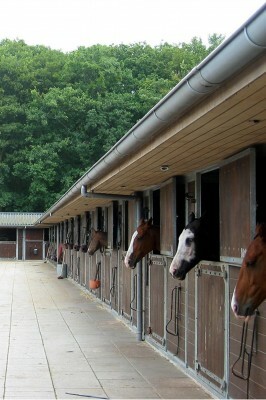 At the end of the stables on your right you will find our Clubhouse. The field is in the center of racetrack (Green square on the map).